Incident Details: Wasdale MRT were alerted by the Aeronautical Rescue Control Centre to the initiation of an emergency beacon in the central fells south of Great End. After some investigation, this turned out to belong to a lone 34 year old walker who had become benighted and lost, on a walk from Langdale. Wasdale turned out immediately to search up Eskdale, and over the top of Scafell, in absolutely atrocious conditions, with high wind and driving rain. They requested assistance from Keswick and Langdale teams to search their sides of the mountain, and approach routes. After the search had been under way for a while, the misper managed to talk to Police Scotland, and give a reasonable description of where he was. As a result of this, he was found quite swiftly by Wasdale Team members in Calf Cove – had that not been the case, he could have been at serious risk. 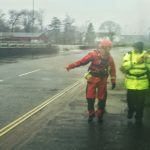 As it was, Keswick Team members who brought the casualty down to Seathwaite, as this seemed the fastest evacuation route, were faced with enormous becks to cross, and alongside rivers in full spate, whilst being battered by high winds. The road down Borrowdale was covered by flood water in a dozen places, which made the drive back to base almost equally interesting. The forecast for the coming weekend is as bad as yesterday, if not worse. It would be advisable to consider carefully what, if any, might constitute a safe outing if you are considering being on the hills. 21 Team members – 4 hours, 46 minutes.